If you have had recurrent and frequent ankle sprains you may perceive some instability in your ankle when standing or walking. If your ankle feels as if it is going to twist or sprain while walking over the slightest uneven terrain, this condition is referred to as lateral ankle instability. If this condition occurs over a long period of time, it is considered chronic lateral ankle instability. Generally speaking this condition is due to the stretching out -or complete tear of the outer ( lateral ) ankle ligaments. The anterior talo-fibular ligament or the calcaneo-fibular ligament. If conservative bracing is not effective then contemporary surgical reconstruction is very effective to prevent further instabilty. The most common method used today for this is called the Brostrom-Gould Pocedure. 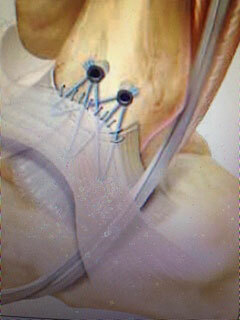 This involves reconstruction of the ligament with reinforcement utilizing fiberwire suture for added strength. The schematic picture to the right demonstrates this procedure. If you feel that the treatment of your suspected ankle sprain is not effective, and that your pain and/or swelling is not decreasing, these may be signs of a more advanced injury. In this situation, we recommend that you immediately seek in person professional medical attention.